DBS Residential Solutions is a basement finishing company and the authorized TBF dealer serving customers primarily in Duluth MN, Superior WI, Cloquet MN, and Two Harbors MN. We use and install only top-quality, patented products and materials, including basement tiles, walls, and floors, as well as basement windows and energy-efficient dehumidifiers. Any and all work completed by our basement finishing contractors comes with a 50-year mold-and-moisture warranty to ensure lasting comfort in your home. We design, build and exclusively install our basement products. Replacing your basement's old, drafty windows, for example, not only improves your home's curb appeal but reduces unwanted energy loss. Our EverLast Basement Windows are nearly three-times more energy efficient than single pane windows because they seal in your heated or cooled air, keeping your home more comfortable. Their environmentally-friendly composition promotes solar gain during cold months and limits it during warm months. We guarantee that our EverLast Basement Windows will never rot and will not support mold growth. They're easy to open, close, and clean, and make a great addition to any Minnesota home basement. Good job Mark...very happy with the work and will be calling in the spring with more! 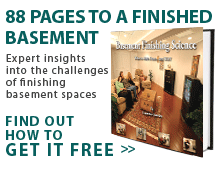 Are you looking to upgrade your Minnesota basement? If so, we're the basement remodeling contractors for you. Whether you would like to completely remodel your basement, or you would prefer to make only a few small (but noticeable) improvements, we can help. Our Minnesota basement finishing contractors can transform your basement into a home theatre, home office, TV room, or family playroom. Whatever your goals, our basement contractors can get the job done in a timely, professional, and affordable manner. We have considerable experience in remodeling and refinishing basement walls, floors, ceilings, and windows. These home improvements will not only increase the amount of usable space in your home, but also drastically increase your home's resale value. What's more, eco-friendly basement remodeling additions could even save you money each month. For years, we have proudly served Minnesota residents in St. Paul, Minneapolis, Duluth, Rochester, and Bloomington. If you're ready to receive a free basement remodeling consultation and quote from one of our experienced Minnesota basement contractors, contact us today! Finishing your basement is the most affordable way to increase your home's living space. But doing this construction work with standard "above-grade" materials is a recipe for disaster — in the form of mold, mildew and ongoing moisture problems. Total Basement Finishing eliminates these problems by only using waterproof, mold-resistant materials that are designed specifically for basement environments. "Luke and his partner real know what they are doing. Lukes training must..."
Luke and his partner real know what they are doing. Lukes training must have been very good. He likes what he is doing and a gret advocate for his compan. Wet carpet and flooring coming up from the foundation. I would like to add a bedroom in the basement for my son; this would include the need for at least one, I would like two egress windows to be installed. Looking to finish our basement. New home constructed two years ago. Thanks! Looking to finish a part of our basement that is not finished. And the estimate of cost for it. Looking to do it as soon as possible. Thanks. Looking to completely finish basement asap. Looking to get the quotes for creating recreational room in my unfinished basement. Looking for setting up home theater. New construction house - Unfinished basement. Would like to add 2 bedrooms, bathroom, and finish playroom and family area. Would require financing. Refinishing the basement after water seepage this past summer. Comment: Wet carpet and flooring coming up from the foundation. Comment: I would like to add a bedroom in the basement for my son; this would include the need for at least one, I would like two egress windows to be installed. Comment: Looking to finish our basement. New home constructed two years ago. Thanks! Comment: Looking to finish a part of our basement that is not finished. And the estimate of cost for it. Looking to do it as soon as possible. Thanks. Comment: Looking to completely finish basement asap. Comment: Looking to get the quotes for creating recreational room in my unfinished basement. Looking for setting up home theater.